BR built 2-6-2T No 41227 is seen at the head of the 5:35pm Rugby to Leamington motor fitted local passenger service on the last day of service. At the end of the Second World War the LMS still owned various elderly LNWR tank engines which had come to the end of their useful life, only the outbreak of the war stopping them from being scrapped. 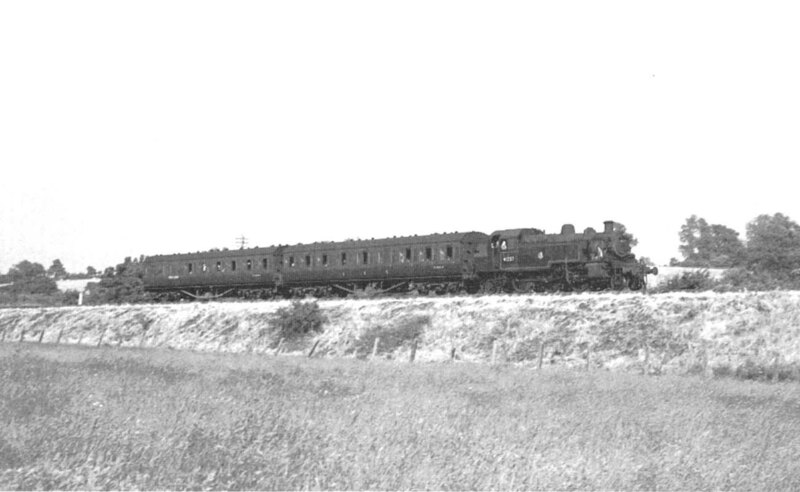 The operating department required a new small class 2 locomotive to replace them and to a specification that incorporated various labour saving devices as well as easy access for maintenance. George Ivatt had succeeded Charles Fairburn as LMS Chief Mechanical Engineer (CME) after the latter's sudden death ended his eighteen months of tenure as CME. The labour saving design incorporated a lot of American practice seen applied to the many USA Transport Corp's locomotives running on Britain's railways in the build up to the invasion of Europe. Self-emptying ashpans and rocking grates were just two examples as was the practice of adopting high running plates with the running plate in front of the cylinders removed to ease access to moving parts.